Mack Rides has taken the idea of space utilisation and visitor throughput to the next level at Europa Park, creating two separate ride experiences on the same track. 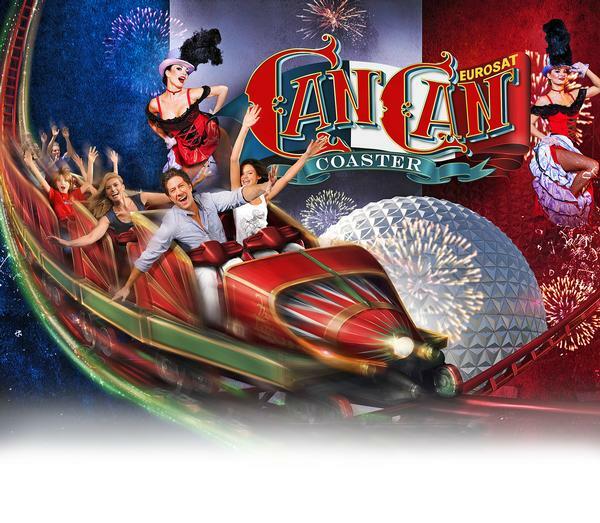 The main experience is the CanCan Coaster, a traditional rollercoaster ride. The other is a VR coaster ride called Coastiality VR. Both run on the tracks of the Eurosat coaster – a ride built in 1989 inside the park’s iconic sphere – which has been completely reimagined, with a new design and theming based on the Moulin Rouge cabaret in Paris. 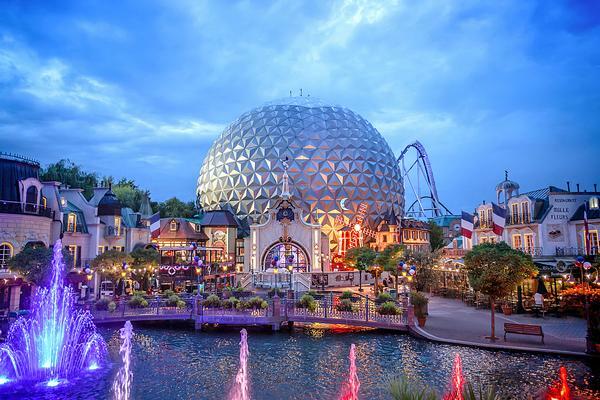 EuroSat has undergone an extensive renovation at the cost of several million euros as part of a retheming of the French area of the popular German theme park. The ride’s track has been completely rebuilt by Mack Rides over a period of 10 months, with the track layout remaining very similar to its original design as a tribute to its creator – the late Franz Mack. The most significant change has been the addition of a second station for the ride, so visitors can be queued and loaded separately for the two experiences. “EuroSat now offers a much smoother ride with a softer track and new trains,” Europa Park founder Roland Mack tells Attractions Management. Created by MackMedia, the EuroSat Coastiality VR experience starts in the queue line – a world first for any ride, with the new format dubbed ‘roam and ride’. The track for Coastiality is slightly longer than the 922m (3,024ft) CanCan coaster, extending an additional 50m (164ft) to accommodate the second station. The Coastiality experience lasts around eight minutes and this part of the ride has a capacity of 210 people an hour. CanCan by comparison lasts three-and-a-half minutes and has the capacity to carry 1,050 people an hour. Both rides reaches speeds of up to 60kmph (37.3mph). The launch marks the start of a partnership between two family-run businesses, the Macks and the Cléricos. 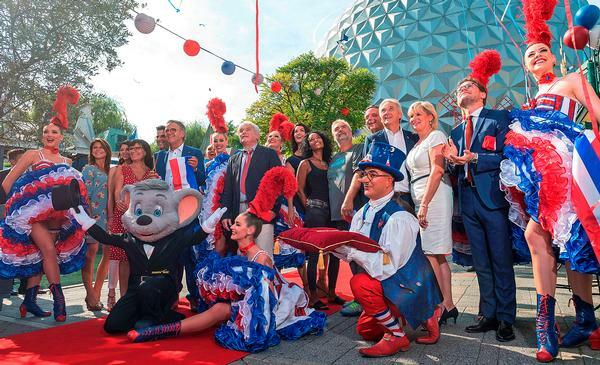 The Mack family – who own Europa park and Mack Rides – have teamed with the Cléricos, who have owned and operated the Moulin Rouge in Paris since 1955. Jacki Clérico, who died in 2013, was credited for reviving the brand over the last fifty years, with his son Jean-Jacques Clérico now in charge. “We are two families with the same purpose – to entertain people,” says Mack. The partnership marks the first time Moulin Rouge has partnered with a theme park. When the company was first founded in 1889, owners, Joseph Oller and Charles Zidler, planned to build an amusement. 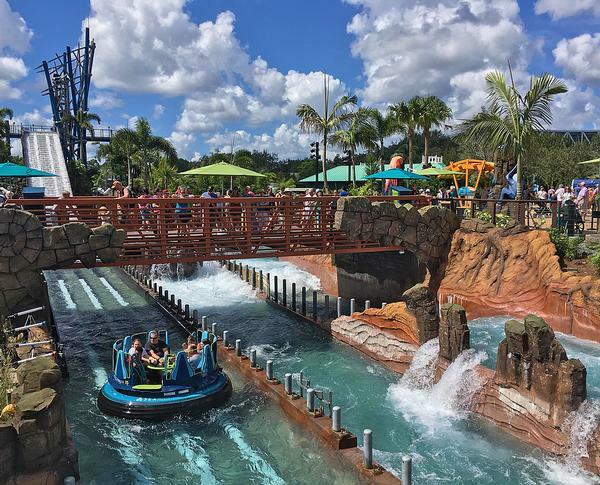 SeaWorld’s focus on creating “Experiences that Matter” has continued, with the launch of the operator’s latest Orlando attraction – the Intamin-manufactured Infinity Falls river ride. Featuring a world record 40ft (12.2m) drop, the ride finds inspiration in its design from the rainforests of South America, with guests taken through a jungle as they travel along the 1,520ft (460 m) rapids. The ride, which features eight-seater rafts, has an unusual element in the form of a vertical lift which takes riders up a giant waterfall to the big drop. According to SeaWorld, visitors will have the opportunity to take on the role of a conservationist on a journey through the rainforest, where they can learn about the importance of freshwater conservation through interactive games and stories throughout the ride experience. With the new addition comes a themed village area featuring retailing, rest and dining areas, and interactive educational experiences. SeaWorld and Coca-Cola have made a joint US$100k donation through the SeaWorld and Busch Gardens Conservation Fund – in partnership with The Everglades Foundation – to support a freshwater replenishment project with non-profit Audubon Florida. Using interactive games, player scores will be converted into real-world water saving initiatives using these funds. The project, says SeaWorld, will help replenish 37 million gallons of water in the Western Everglades at Audubon’s Corkscrew Swamp Sanctuary in Naples, Florida. “From the thrilling rapids, to its amazing vertical lift, Infinity Falls is an adventure that appeals to the entire family,” says Mark Pauls, president of SeaWorld Orlando. 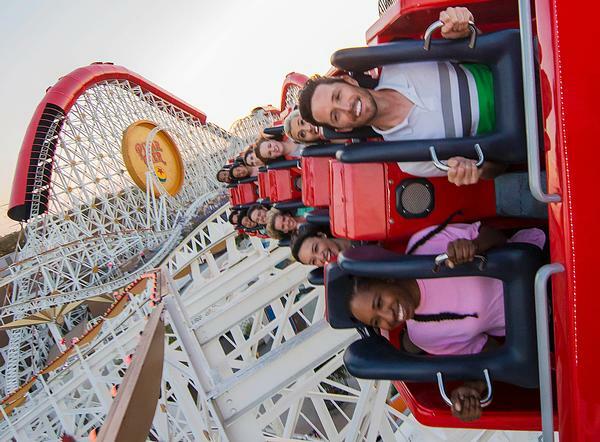 As part of the redeveloped Pixar Pier at Disney’s California Adventure, the park’s signature California Screamin’ ride has undergone a major transformation, redesigned by Disney’s Imagineers as the brand new Incredicoaster. First opened in 2001 at a cost of US$60m, the steel-launch coaster features an all-new Incredibles-themed experience, which includes a mid-century, modern-style loading area, new character moments and redesigned carriages. The ride, manufactured by Intamin and with design by Ingenieur Büro Stengel GmbH, employs music, lighting, special effects and exciting character figures, while distinctively coloured vehicles add to the extreme thrills on this super-speedy coaster. The ride is based on Incredibles 2, which opened in theatres earlier this year. In the pre-show, screens show the fictional Edna Mode being interviewed for the ride’s rechristening as the Incredicoaster. While being interviewed, Jack-Jack begins using his unpredictable super powers, eventually escaping. The Incredibles then take off through the ride trying to catch him. Each member of the family uses their superpowers – Dash his super speed, Elastigirl her stretch powers, Mr Incredible his super strength and Violet her force field – to try and stop him. Eventually they catch up with Jack-Jack, who’s calmed by being given a cookie to eat. The story plays out over 6,072ft (1,851m), with a vertical loop and drops of up to 108ft (33m). The launch system accelerates guests from 0 to 55mph (88.5kmph) in just four seconds, making it the fastest attraction at the park. It also holds the distinction of being the world’s longest looping coaster. Because the park is located adjacent to a residential zone and must adhere to noise restriction guidelines, the ride was created with special tubes designed to direct riders’ screams back into the park. Following the redevelopment, those tubes now have Incredibles characters in them and play out as part of the ride experience. 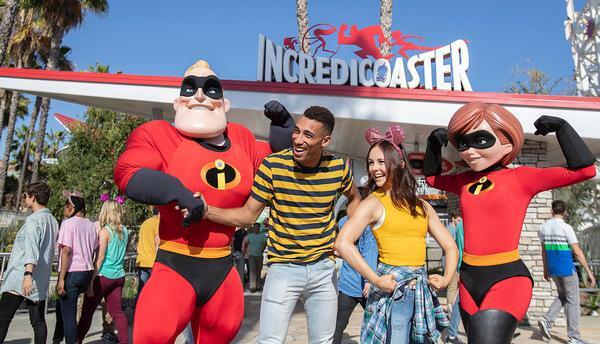 Anchored by the Incredicoaster, Pixar Pier features four different themed neighbourhoods using Pixar’s most popular IPs. The area closed in January 2018 to undergo its redesign, reopening in June.